England rugby international Danny Cipriani has been fined £2,000 after an assault in a Jersey nightclub. The Gloucester player pleaded guilty to common assault and resisting arrest and was ordered to pay £250 compensation to a woman police officer. Three other charges – assault on police, larceny and being disorderly on licensed premises – were dropped. The 30-year-old fly-half has seven days to pay the fine and compensation or face 10 weeks in prison. Defence advocate Mike Preston said Cipriani was sorry for the “confusing situation” and was “mortified if he harmed the police officer in any way”. Jersey Magistrates’ Court was told he “had too many drinks” at Drift nightclub in The Royal Yacht Hotel, St Helier, and police were called when Cipriani tried to grab a body camera off a doorman. Mr Preston argued his client did this because fame had made him more sensitive to being filmed and he was confused by the situation. He was later picked up by police but managed to escape from his cuffs and a second officer was needed to restrain him. Cipriani is said to have sworn at the woman officer, telling her to get off him. The court heard she was left with bruises on her bicep and red marks on her neck. 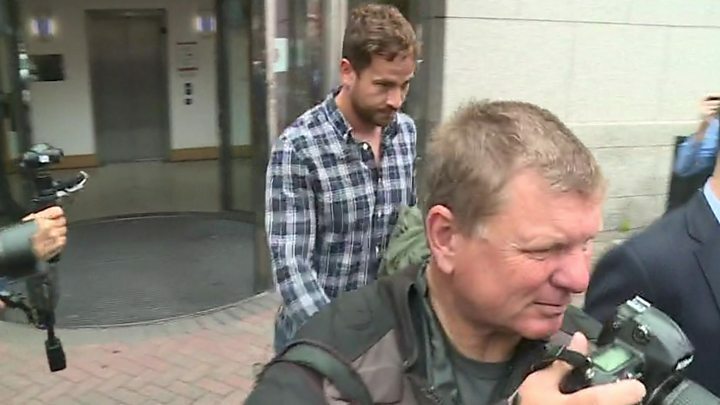 The former Wasps and Sale stand-off did not think he had done anything wrong at the time and did not understand why the police had been called, the court was told. He was in the island with his club as part of a pre-season tour and was supported in court by Gloucester team captain Willi Heinz. Cipriani, who moved to Kingsholm in the summer, is due to make his debut in a friendly against Ulster on Saturday. In response to his player’s guilty plea, Gloucester chief executive Stephen Vaughan commented: “We will deal with it in a robust but balanced way but based purely on the facts. “As a high-profile sportsperson there is often a large degree of public and media scrutiny involved, which Danny is well aware of. “The incident in question was over in a matter of seconds and was a reaction to the conduct of other parties involved. Last week Cipriani vowed to “do everything I can” to remain in the England set-up after making his first Test match start in 10 years during the summer tour to South Africa. He was dropped from the national side in 2008 – the same year he won his first cap – after visiting a nightclub prior to a match against Scotland. In 2011, Cipriani was fined by his then club Melbourne Rebels for taking a bottle of vodka from a nightclub and later in the same year served a one-match ban for breaking a team curfew. Four years later he was banned for driving for 18 months and ordered to pay fines and costs totalling £7,620 after being found to be nearly twice the drink-drive limit. Over the last year or so the rugby had really been doing the talking for Danny Cipriani. Many thought he wouldn’t get a look in under Eddie Jones but Jones recalled him for the tour of South Africa in June. He kept his head down, worked extremely hard on the tour, got a start in the third Test and set up the try which led to an England victory. I think in terms of his club future, Gloucester will put it down as an incident they can move on from. At the moment, England are staying very tight-lipped. It’s pretty hard to second guess Eddie Jones’ position. In the past, Jones has said that what happens on club duty is not to do with him and that if someone behaves themselves on and off the field in an England camp, that’s what he’s interested in. On the tour of South Africa, Cipriani’s behaviour was exemplary and Jones made a big point of saying that before selecting Cipriani for the third Test. But with the World Cup on the horizon, no England players can afford slip-ups, let alone players whose behaviour in the past has been called into question. Cipriani just had to keep his head down. He was probably in the best place he’s been in for a decade. Gloucester were saying Cipriani had been worked extremely hard in pre-season and that he’d been a fantastic addition to the club. Up until Tuesday night, things were going swimmingly. He must just feel so disappointed with himself. His international future is now hanging by a thread.